The gardens at the Rockefeller Center were visited by Trevor Bowen, managing director of the famous London department store Barkers. 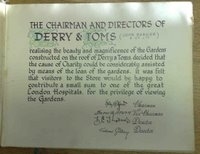 The company had recently purchased Derry and Toms, a family-owned department store in Kensington, London. Bowen had liked what he had seen in New York and so commissioned Hancock to create a similar effect in the heart of London. This time Hancock was to build three gardens, each with its own unique style and planting. As these plans show, the gardens were; a Tudor garden complete with herringbone brickwork, impressive Tudor arches and much wrought iron. 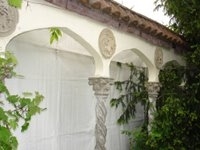 A splendid Spanish garden with palm trees and fountains as well as Moorish colonnades. And a woodland garden, built with a cascade, a river and grassy banks. These further plans are taken from a 1950’s promotional booklet published by Derry and Toms. Once again the logistics involved in the construction were impressive. Before planting and building could start a thick bitumastic base was laid on the roof, followed by a layer of loose brick and rubble that was arranged in a fan-like pattern to aid drainage. On top of this was a layer of topsoil of between 18 and 36 inches, into which the planting was made. Water came from Derry and Toms own artesian wells. On opening day the gardens contained over 500 different varieties of trees and shrubs. 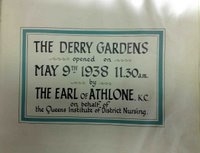 The gardens were completed in 1938 at a cost of £25,000 and were officially opened by the Earl of Athlone on 9 May of that year. Visitors were charged a shilling (5p) to tour the gardens. Monies raised that year were donated to the Queen's Institute of District Nursing. Over the next 30 years over £120,000 was also raised for local hospitals. The third short film on this video shows the gardens as they looked in 1938. 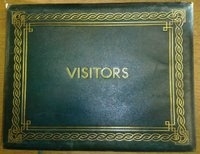 These four images are of the Derry Gardens Visitor Book from that day in 1938. This green Morocco-leather bound book is in wonderful condition and not only contains the signatures and details of the grand opening of the gardens, at 11:30am on 9 May 1938, but it also contains the details of the opening of the gardens for the next four years. Including visits by Queen Mary and other members of the British Royal family. Another book contains the signatures and details of other visitors including stars of stage and screen, such as Raymond Massey and British comedian Will Hay. It is not difficult to image the attraction of these unique gardens. The biggest of their kind in Europe. This advertisement, likely to have come from magazine of the time, shows the gardens in all their spectacular glory. 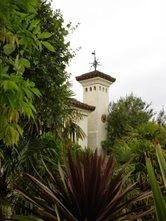 Unfortunately, the orientation of the Spanish bell tower and building is incorrect. They both should sit squarely with the front of the department store. This drawing may have been made from Hancock's early sketches and plans of the gardens? A year later, in 1939, a telescope was added to one of the viewing platforms so that visitors could gaze on the distant Surrey Hills or, if they wished, over Kensington and the surrounding roof tops. The following series of photographs show the gardens as they were when Hancock completed his work in 1938 and again in 2007. Nearly 70 years later much of what he had envisaged remains. Many of the original trees, now covered by preservation orders, still stand. 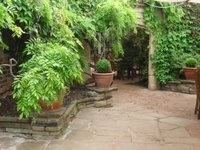 And the beautiful gardens themselves are now Grade II listed. The Spanish campanile as it was in 1938 and nearly 70 years later in 2007. Many of the original plants have now matured and give the Spanish garden a truly Mediterranean look and feel. Originally the tower and the other Spanish buildings were painted pink. A fact only discovered recently during restoration work. Similarly, bright Spanish tiles that lined the walkways had also been painted over during the 1970's when the gardens were owned by Biba. They are now back as Ralph had intended them. Similarly, the Tudor garden has matured, but one can quite clearly see the Cotswold dry stone wall and herringbone brick path as Hancock had built them. And, through the Tudor archway, the wrought iron water pump can be seen. 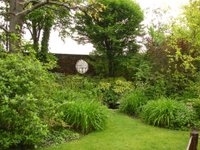 Albeit from a slightly different angle, the Woodland garden still maintains that natural feel. With mature trees and a running brook it is easy to forget that visitors are 100 feet above Kensington High Street. Another view of the Spanish garden. These images clearly show the Moorish arches. The ones used in Kensington were cast from the exact same moulds as those used at the Rockefeller Center. 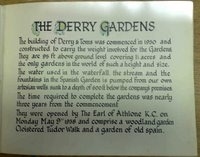 To learn more about the history of Derry and Toms and the development of the roof gardens a separate information sheet, written in 2007, can be downloaded by clicking here (PDF, 600k). For an up-to-date look at the gardens click Kensington Roof Gardens Reborn.